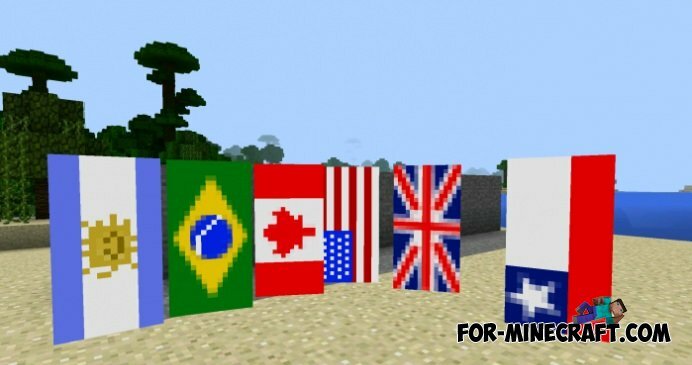 Banners mod adds twenty different banners to the world of Minecraft Pocket Edition, each representing a country flag. There are countries with high population, but in the future we hope to see Sweden (Minecraft home), Norway and other smaller countries. All flags can be obtained using Too ManyItems or Tool Menu, as there are no recipes of crafting. Coutry Banners Mod for 0.10.4 / 0.10.5This mod adds to the game world Minecraft Pocket Edition banner (flag) in many countries, which you can use for decorative purposes and as a symbol of their country or any other. OpalCraft mod for MCPE 0.10.5Opal is a gem (Statistics in Australia it is 97% of all the stocks in the world) .This mod adds opal ore, as well as new craft of this precious ore. Cheat pack for Minecraft Pocket Edition 0.10.5The mod adds a button in the corner of the screen, which will allow any cheat lists functions that can work equally online or offline in MCPE. For example, you can activate the flight online!